And with Arsenios you dance in the heavens. Our Venerable Father Arsenios the Wonderworker was from Constantinople, and the son of pious and wealthy parents, the first according to posterity. While being illustrious according to posterity, the Saint was granted by the emperor another office, to be the general and patrician of the theme known as Kibyrrhaiotai. And when a royal fleet was dispatched, the Saint served as its admiral. Because a great tempest arose, the sea boiled from its depth, and the ships of the fleet capsized. His life alone was spared and he came to dry land. By this he found freedom to receive that which he long desired, namely to be dressed in the angelic schema of the monks. Therefore he mortified his body and subjected it to the soul with fasting, with vigils, with sleeping on the ground and with other hardships. With this he confined his flesh with heavy iron chains, iron which was truly sturdier and stronger than diamonds. The streams of his tears and all-night standing, and his battles against evil spirits, and the patience he exhibited during the cold of winter and the heat of summer, all these I say, who is able to recount? 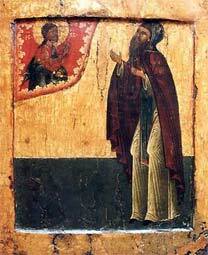 With such struggles the blessed one struggled, and he was sent by the Holy Spirit to a place adjacent to Hieron. Departing for that place with his incessant streams of tears, the renowned one made that place to be a valley of lamentation. His clothing was made of goat's hair, so that whatever part of his body was not burdened with iron chain he burdened with his garment of hair. His food, or we should say his lack of food, was wild vegetables. These he did not eat to satiety, but only for a taste. His thirst was consoled only with very little water, which he received every two or three days. Later he withdrew from that place and went to the wondrous Mount Latros which is in Asia Minor. There the wondrous one passed his life most wondrously, killing an asp by his prayers and the sign of the cross, which had nested there and was poisoning the waters. Withdrawing from there, he went by divine command to the Monastery known as Kellivara, and after a short time there he became abbot, encouraging many in the work of virtue. Soon after he withdrew from the monastery and returned again to his desired quietude, where he lived with want, distress, mortification, and was a recluse living in a hole, in which nested and dwelt many wild creatures. There he lived in quietude, appearing as another Prophet Daniel, for although he had remained unharmed in a pit of lions, so also did this magnanimous Arsenios remain in that hole which was a dwelling place for wild beasts, where he remained unharmed and untouched. Perhaps the Saint banished the wild beasts residing there by his prayers, making that hole a school for souls. When the brothers of the monastery went to visit him, they begged him to return with them, so the Saint returned again to the monastery. Although one could find him there, he did not live a communal life with the other brothers. Rather he enclosed himself inside a tight cell, where he worshiped God alone by himself. And for six days out of the week, he neither spoke with anyone nor did he eat. Only on Sunday did the Saint make it a habit to speak and to eat. What more can be said? The Saint arrived at such a state of dispassion, that the renowned one did not even eat physical food, but he was fed by a divine Angel. And he received the grace to work miracles from the Lord. Once he stirred bitter waters with his staff and changed them to be sweet. Thus the Saint conducted himself with sensibility, bravery, prudence and righteousness, and arrived at the end of his life, being called to the heavenly mansions. For this reason he called for all the monks that lived in the surrounding area and taught them about renouncing the world and worldly things. He also taught them about patience, brotherly love, humility and prayer. After this he knelt, and with his eyes filled with tears, he delivered his holy soul into the hands of God, and worked many miracles after his death. Once the Saint healed a demonized man after the brothers implored him. For he tried to put a hole through the grave of the Saint, and for his impudence he became paralyzed. He then came to his senses and repented. Likewise a monk who suffered with dropsy approached the grave of the Saint, and implored him to heal him. And immediately - O the miracle! - he received his health, and thanked and glorified Christ Who glorifies His Saints, for He is the only true Savior of our souls.